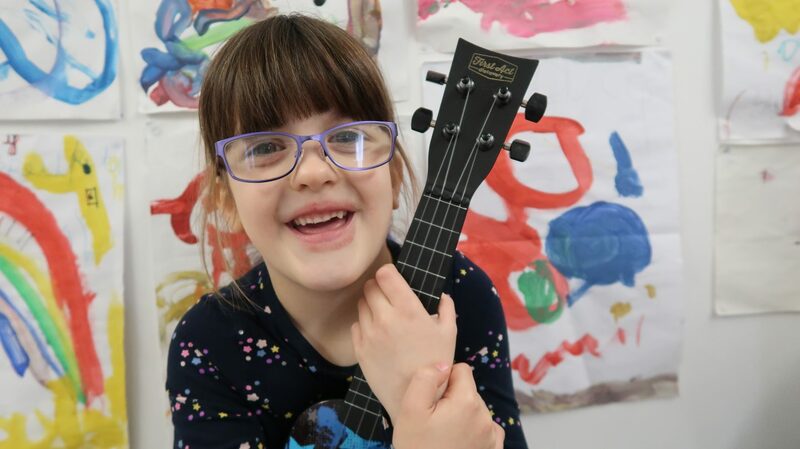 When Daisy started the new school term in September she was thrilled to hear that her class would be learning how to play an instrument. Her class is leaning to play keyboards at the moment and she’s loving it. She has always loved music, dancing and clapping along to daddy playing his guitar from a very young age. 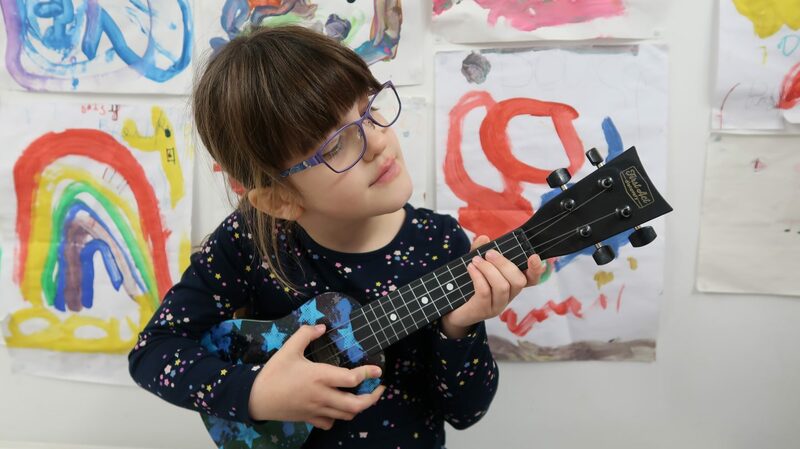 Daisy has always wanted to follow in her dad’s footsteps by learning the guitar so when a First Act Discovery Ukulele by Jazwares arrived for her to review she was very excited. 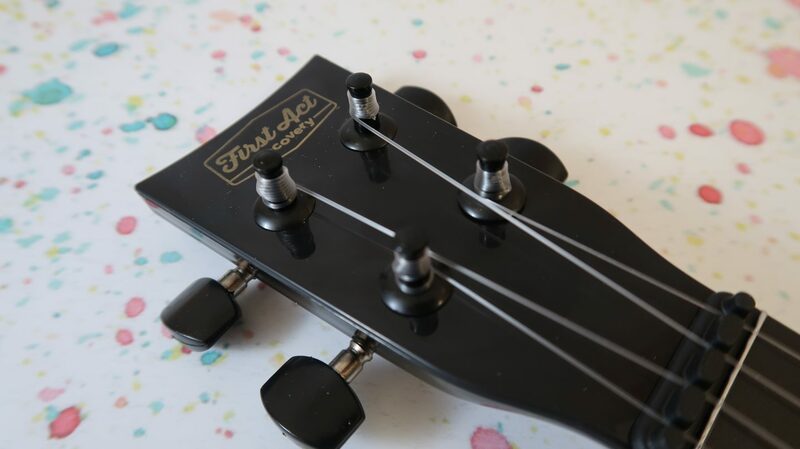 The First Act Discovery Ukulele has been specially designed for kids to get that authentic ukulele sound. The guitar-style tuning gears and nylon strings keep the ukulele in tune and sounding great. We have very kindly been given an extra First Act Discovery to giveaway to one of our lucky readers too ! 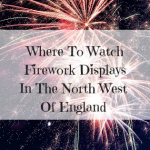 Read our review then enter the giveaway using the gleam app at the end. 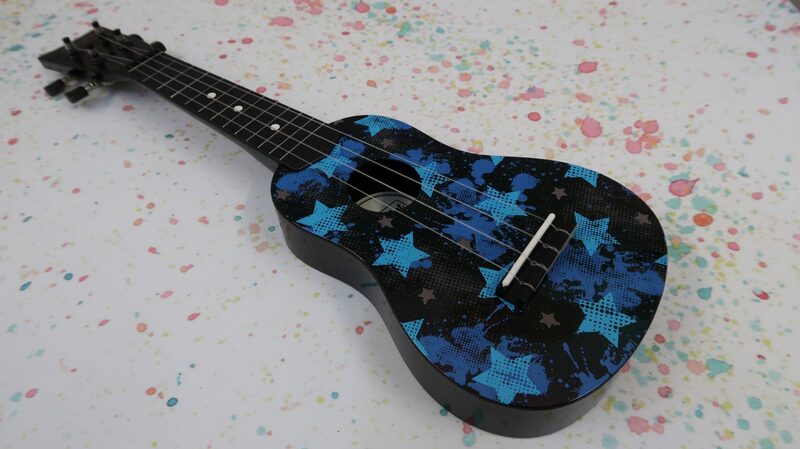 The First Act Discovery Ukulele is available in two designs, Black with blue stars and White with blue butterflies. They both have a traditional soprano-size body which is the perfect size for kids. The nylon strings are nice and easy for kids to strum, they are soft, flexible and make a nice sound when played. Daisy couldn’t wait to pick up her new ukulele and learn how to play. Daddy tuned it for her and away she went, strumming the cords and singing along to her own tune. Luckily we have daddy on hand who has been playing guitar for over twenty years, he has been teaching Daisy the basics. She has been getting used to holding the ukulele in the right position and learning all about chords. Kids can benefit so much from learning to play an instrument, it’s great for improving coordination, memory and perseverance. It also creates a sense of achievement which is fantastic for self-esteem. Learning to play an instrument can seem like a creative pursuit but it’s actually a really good all round learning experience, incorporating maths, reading and comprehension skills too. The ukulele is really good quality and very easy for Daisy to hold and play. I love that it looks exactly like an authentic ukulele and not at all toy like. Daisy loves her new ukulele, we will definitely be getting Jake one once he’s a little older too. 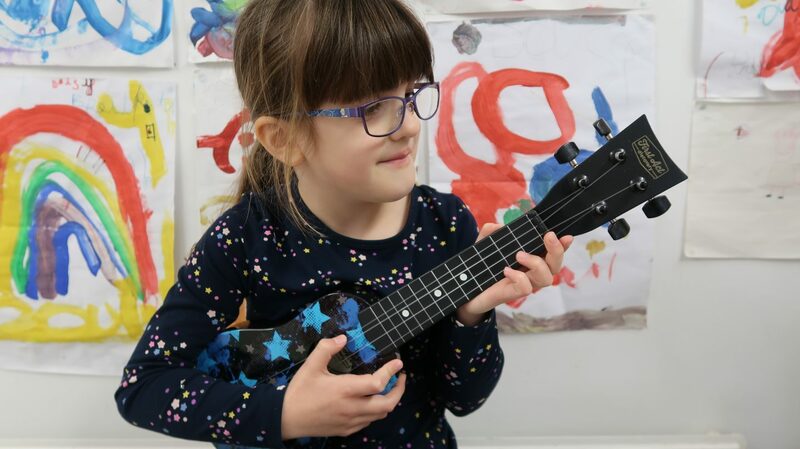 The First Act Discovery Ukulele is suitable for ages 6+ and is available to buy from Smyths and other good toy retailers. If you would like the chance to win a First Act Discovery Ukulele you can enter the giveaway below using the gleam app. Make sure you pop back daily for an extra bonus entry. Have a read the terms and conditions and best of luck with your entry. The Closing date is 14.11.2018 11.59pm. Disclosure: We were sent the First Act Discovery Ukulele free for the purpose of this review. All opinions are my own. My eldest son is currently learning to play the guitar and my younger son wants to learn to play the drums! My two girls want to play the harp and violin. My nephew would love this. Gorgeous design. I don’t have any kids but I’ve wanted to learn to play the trumpet for years! My daughter wants to learn piano at the moment. My sons both play the piano but have said they would love to try the ukulele – I love Eddie Vedder’s ukulele album and listen to it a lot so this may have influenced them! I am entering for my niece who is desperate to play the guitar. This would be a perfect starting point for her. The eldest is very keen to learn the guitar and is saving up to buy one. My son wants to play the saxaphone! Started to learn recorder and now going on to the guitar. 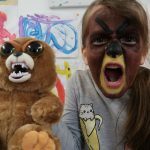 My daughter wants to learn to play the ukulele, so this prize would be perfect, thanks. My daughter bought a keyboard with birthday money and she’s been playing on it non stop! She’s also asked for a ukulele and a flute for Xmas. My twin girls would love to play an electronic keyboard. My son loves playing the tin whistle and would like to learn the bagpipes or any other instrument. My nephew would love to learn the guitar. Both mine want to learn drums at the moment! My daughter has just started to learn the clarinet, she’s getting really good! Honestly my son has been inspired by his grandparents and would love to play the ukulele. His granny goes to ukulele classes each week after choir and his grandad is self-taught! The boys want to play the drums and the guitar, their older brother played the steelpans for a year & loved them.